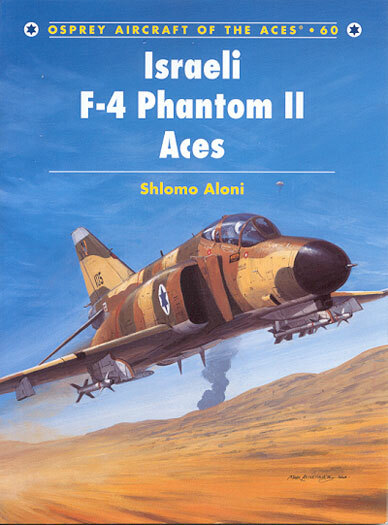 Osprey Publications latest volume in the Aircraft of the Aces Series is Number 60, dealing with the use of F-4E Phantom II by the Israeli Air Force. The author, Shlomo Aloni, is an authority and prolific writer on the subject of Middle-Eastern air wars. He has previously written books for Osprey on the subject of Mirage III and Nesher Aces (Aces No 59) and Arab-Israeli Air Wars 1947-1982 (Conbat Aircraft 23). Aloni is very familiar with his subjects and has again produced a competent volume on a typically difficult to research subject. This book covers all aspects of the Israeli use of the F-4 Phantom (Kurnass in IDF parlance), from service entry in 1969 until the end of the war in Southern Lebanon in June 1982 when the last Syrian MiGs fell to the F-4. As a result it does not cover the upgrading of the F-4 to Kurnass 2000 standard or the continued operational used in the recce and strike roles. Aloni deals with the story of the Kurnass in a logical manner starting with delivery and War of Attrition. He then addresses the period from 1970 to 1973 as the force expanded. During this time the Kurnass came of age in IDF service, scoring 25 kills, including importantly as a night/all weather alert fighter. The bulk of the book however is devoted to a detailed examination of F-4 operations during the Yom Kippur War of October 1973. The Kurnass Squadrons were primarily devoted to strike operations during Yom Kippur, including a disastrous confrontation with the SAMs of the Egyptian Air Defence Force. Aloni is not afraid to admit that the IDF had no technical answer to the Russian SAM systems in 1973, and that airpower was only able to be decisive on the battlefield once the Egyptian army moved out from the SAM umbrella and that umbrella was subsequently rolled up by IDF ground offensives. Despite being tasked primarily as strikers, including for important strategic strike operations deep into Egypt and Syria, Kurnass crews amassed a respectable kill tally of 85. The Mirage during the same period scored some 211, however it should be noted that most Kurnass kills occurred during engagements as they fought their way into and out of their target areas laden with bombs, and not on air defence missions. Final operations over Lebanon, playing second fiddle to the F-15, when 6.5 further kills were scored, round out the volume. This book will have a wide appeal given the popularity of the IDF and the frequency of Middle East conflicts. For those interested in the men behind the machines, there are many included narratives from key players involved in Kurnass operations. For "Facts and figures" fans, there are tables included that detail all the Aces who flew the Kurnass plus a comprehensive list of kills by date, unit, opponent, weapon employed and approximate location. Two pages of 1/100 scale drawings of the F-4 round this section out. 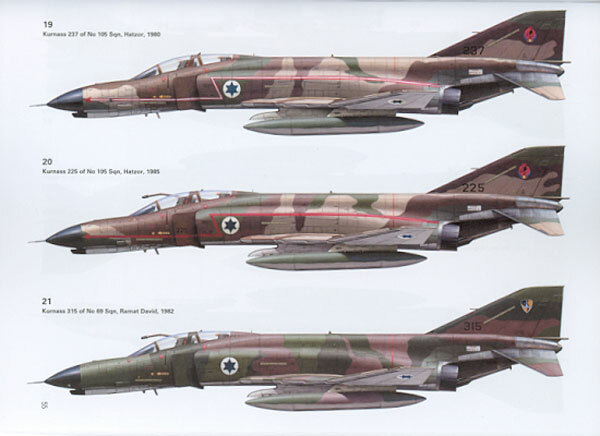 As usual for Osprey Publications, 33 colour profiles fill the centre pages, along with a good top and bottom view of the Israeli F-4 scheme. Interestingly profiles are include for the F-4 and Kurnass 2000 post 1982, despite the text not dealing with this area. No colour photographs are included. This Osprey Book, whilst comprehensive, is not really a modellers reference. The majority of included photographs are small and in black and white, quite often the reader is unable to make out the detail such as kill markings referred to in the caption. Given the nature of the subject the range of photographs is, however, impressive and includes many interesting strike camera BDA images of key attacks in the Yom Kippur War. The comment on the photographs should not put one off this book, as it is an excellent way to add a human dimension the scale models on the display shelves. The book consists of 96 pages printed on glossy paper between cardboard covers.